The only treatment for celiac disease (CeD) is a lifelong gluten-free diet (GFD). The restrictive nature of the GFD makes adherence a challenge. As an integral part of CeD management, multiple professional organizations recommend regular follow-up with a healthcare provider (HCP). Many CeD patients also participate in patient advocacy groups (PAGs) for education and support. Previous work found that follow-up of CeD patients is highly variable. Here we investigated the self-reported factors associated with HCP follow-up among individuals diagnosed with CeD who participate in a PAG. We conducted a survey of members of Beyond Celiac (a PAG), collecting responses from 1832 U.S. adults ages 19–65 who reported having CeD. The survey queried HCP follow-up related to CeD and included validated instruments for dietary adherence (CDAT), disease-specific symptoms (CSI), and quality of life (CD-QOL). Overall, 27% of respondents diagnosed with CeD at least five years ago reported that they had not visited an HCP about CeD in the last five years. The most frequent reason for not visiting an HCP was “doing fine on my own” (47.6%). 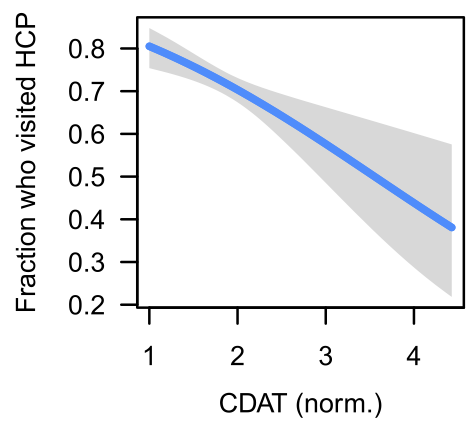 Using multiple logistic regression, we identified significant associations between whether a respondent reported visiting an HCP about CeD in the last five years and the scores for all three validated instruments. In particular, as disease-specific symptoms and quality of life worsened, the probability of having visited an HCP increased. Conversely, as dietary adherence worsened, the probability decreased. Our results suggest that many individuals with CeD manage their disease without ongoing support from an HCP. Our results thus emphasize the need for greater access to high quality CeD care, and highlight an opportunity for PAGs to bring together patients and HCPs to improve management of CeD.